M.Kumar Technocrates's known as Amtech valves are engineering experts. We provide industrial valves with a broad range of valve types and sizes, using the highest quality materials. AMTECH manufacture angle type safety valve threaded or flange type in various materials for wafet/ air/ compressure/ vacuum system , and any other specific field for customer requirements. Angle Pattern, Enclosed Discharge, Screwed Male Threads at Inlet and Screwed Female Ends at Outlet to BS 21 OR bsp-MxF ,npt-M x F design as well as flanged end design. 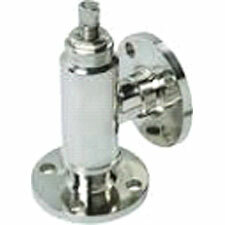 We are providing soft seated and metal seated valves. The soft seat from rubber- viton /silicon / Teflon seated. We also prove Hard face in seat material like stellited ST6. BODY & BONNET CARBON STEEL A 105 /CS ASTM A 216 GR. WCBASTM A 351 CF8/ ASTM A 351CF8M/ ASTM A 351 CF3/ ASTM A 351CF3M /CN7M/DUPLEX STEEL/MONEL K 400/MONEL K 500/GUN METAL/NI -BRONZE/ALUMINIUM BRONZE. SEAT CARBON STEEL A 105 /CS WITH 13% CR STEELS /SS 410 /AISI 304 /AISI 316/ AISI 304L/AISI 316L/CN7M/DUPLEX STEEL/MONEL K 400/MONEL K 500/GUN METAL/NI -BRONZE/ALUMINIUM BRONZE. TRIMS AISI 410/AISI 304/AISI 316/AISI 304L/AISI 316L/CN7M/DUPLEX STEEL/MONEL K 400/MONEL K 500/GUN METAL/NI -BRONZE/ALUMINIUM BRONZE. Your partner for industrial valves. © Copyright 2016 by AMTECH. All Rights Reserved.